Ron Brown's family said he would be "greatly missed"
Hundreds of mourners attended the funeral of former Leith Labour MP Ron Brown which took place an Edinburgh. 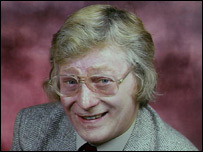 Mr Brown, known as Red Ron for his left-wing views, died last week at the age of 69. He had been suffering from liver disease and is survived by two sons and a partner. His time as MP for Leith stretched from 1979 to 1992. During those years he was heavily involved in Scotland's anti-Poll Tax campaign. He also gained a reputation for going to countries such as Libya, Afghanistan and North Korea which were off limits for many other politicians. The most infamous moment in his career came in 1987 during a Poll Tax debate, when he grabbed the Commons mace and threw it to the ground. Mr Brown was eventually deselected and removed from the Labour Party in 1992 but he remained active in local politics and was a member of the Scottish Socialist Party. His funeral was held at Warriston crematorium in Edinburgh on Friday afternoon.